Clarets boss Sean Dyche felt Huddersfield Town winger Rajiv van la Parma’s dive was “as bad as I’ve seen”. The Dutchman went down under no contact as he ran at Matt Lowton 18 minutes from time as he attempted to win a penalty. Referee Chris Kavanagh wasn’t conned, however, and booked the substitute. The game finished goal-less, but Dyche was far from amused. 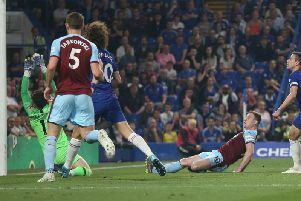 That will be the end of the matter for van la Parra, as he didn’t win a penalty, or see a player sent off, but Dyche said: “I have been harking on about it for about three years with someone diving. “I’m not saying we’re whiter than white, but if one of my players does it, they’re getting the curly finger next week. “The ref was excellent and he should be protected from that. It’s unacceptable in my book – I have been talking about it for three years. It’s not about the player, it’s the moment. “I talk of it for the good of the game. It’s about my kid watching the game, kids diving all over the place, they copy players and it’s got to go. “That one today is as bad as I have seen. “I don’t know the player as a person, it might be off the scale for him, but it’s about the moment. “Maybe the video thing will give the ref a chance, whatever way they bring it in and look at it. “Maybe that will affect it. I saw it again. I was a defender and if you touch someone and go down it’s gamesmanship, but when no contact going down? Town boss David Wagner admitted he had spoken to the player: “I was too far away. Sean was even further away! “I’ve not seen it again. I’ve spoken to him and it was a dive.